To be released on cassette and digitally on 7/20/18. C50 – Dark yellow tape with black imprints. Chrome Plus stock. 2-sided 3-panel J-Card with artwork from Mondo Lava. 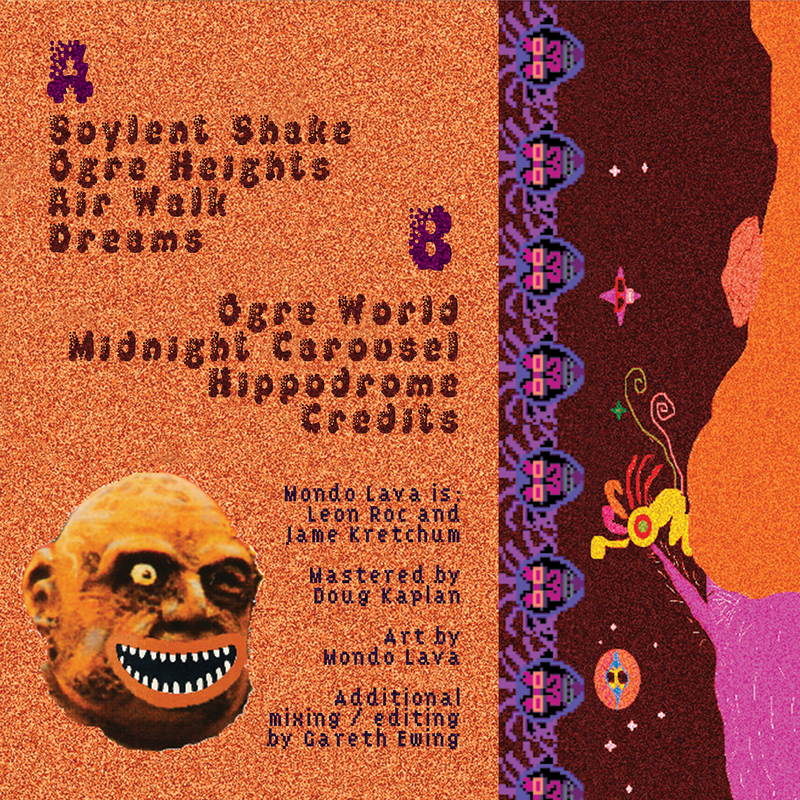 Jame Kretchum and Leon Roc Hu record music under the name Mondo Lava. While their project orbits Davis, CA, its leafy tendrils stretch up north through Humboldt County, down south to Brazil, and straight through the screen back to the realms of the VCR and the Sega Genesis. Ogre Heights follows the lo-fi tropical sprawl of 2014’s Parrot Head Cartridge (HAUSMO26) with a song cycle that flows through carnival-core keyboard sequences, rumbling bass and hand drum grooves, and washed out synth drifts. 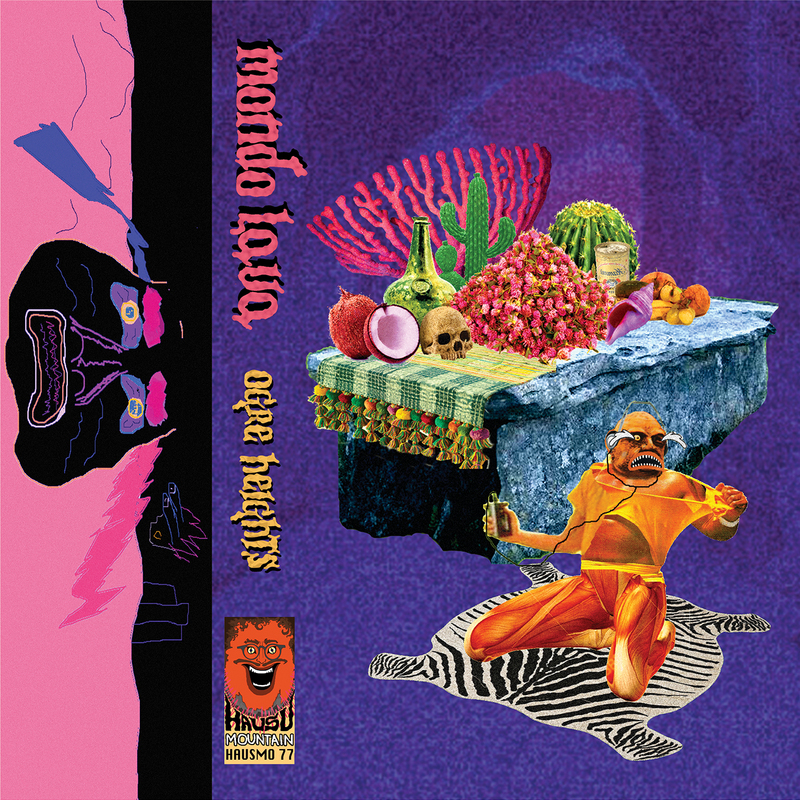 Inspired as much by the prismatic psych-pop productions of 1970s tropicália as by the tape hiss saturated DIY underground of the 2010s, Mondo Lava’s straight-to-cassette compositions settle into organically unfolding loops dotted with Afro-Brazilian drum patterns and blithely spiraling piano solos. The duo delights in juxtaposing sound sources of varying fidelity into anachronistic jams that float through eras and traditions. Percolating Casio arpeggios and video game melodies share the mix with cavernous bass voices akin to the post-dub experiments of Sun Araw / Duppy Gun. Brittle electronic Donkey Kong Country drum tones meld into loping beats with layers of shakers and bongos. Rich organ chord progressions air out alongside distorted synthetic drones and flights of major-key melody. Within the constraints of their hardware and their home recording rig, Mondo Lava sketches worlds replete with one-off characters and fine-grain details as they crest through narrative arcs fit for the slow descent of a gondola lift from the tree line down through the mist to the shoreline below.